Is Philipines Island Siargao the next haven? Sitting on the eastern seaboard of the Philipines, Siargo Used to be relatively unknown except to the surfing community for whom it is mecca. The sleepy town of General Luna caught the attention of wave hunters in the 90’s when western surfers explored the island’s breaks and discovered the barreling waves of surf spots know widely known as cloud 9. Everyone is planning trips to this island or of course, putting up the next resort, restaurant or hotel. There has not been so much excitement about a destination for a while. Could this be the next paradise Island for tourists across the globe. The island was soon put on the grid as a premier surfing destination when it landed on the cover of the US magazine – Surfer in the early 90’s. There were three Australian’s Taylor Knox, Evan Slater and Chris Malloy who were the only surfers there. There were not any local surfers at all. The Philipines is an arcipelego of more than 70,000 islands each ripe with it’s own potential for tourism. But sometimes I think that we forget very quickly that it’s the natural resources that people come to enjoy. The white sandy beaches, clear waters and unspoiled destinations and that with growth, progress and development these natural resources are aslo put under a lot of pressure. Siargao is no exception 625% growth rate from 2012 to 2016 in 5 years it has jumped from 4,400 to 42,000. Whuch has allowed more businesses to open and more local surf instructors to find work. 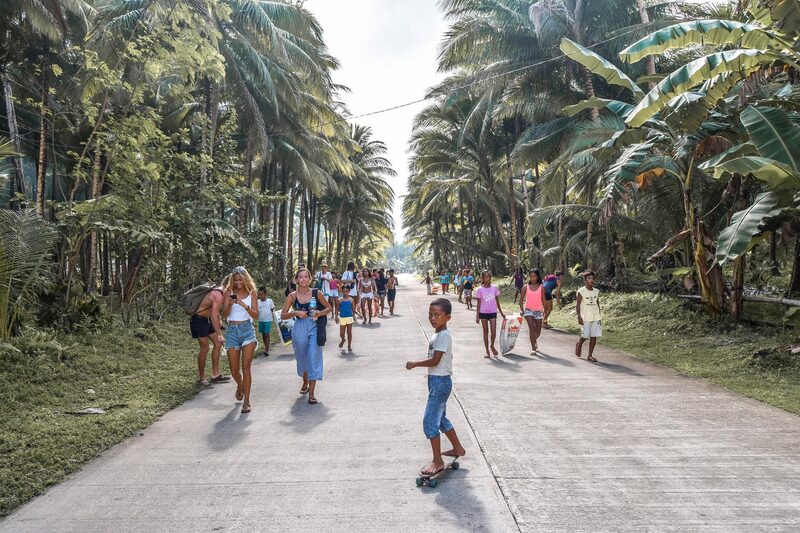 Nevertheless, this comes with consequences, like over crowding and trash Siargao is attracting visitors from across the globe who do not share the same environmental concerns like the locals. Tourism’s positive effects are not exclusive to surf instructors and resort owners. They also trickle down to small communities, fishermen and vendors. People are happy because they don’t have to leave the country to earn a living. Progress is a good thing for a society to evolve but at what costs? When do the scales start to tip to the direction? Siargao is loosing it’s vibe due to more vehicles, hotels, restaurants and trash. Where there are tourist’s there is trash. The lack of proper solid waste management and disposal is the biggest challenge to the conservation of Siargao’s resources. The number one problem of Siargao is it is over populated. Siargao is becoming more known to the Philipines and the rest of the world which is causing more tourists and investors. So the more the people come in the more trash is coming in aslo which is inevitable. I think the responsibility know lies with on what to do with the garbage? Well, honestly you really can not stop development but it boils down the local government unit. Without the help of the LGU the community will not move forward. It’s a very critical point. The LGU and the community need to help each other without that Siargao will not move forward. The next 2 to 10 years will be make or break point. People only see Siargao as a business opportunity but they don’t embrace the lifestyle, that would change everything. People are just buying a lot of lands, build up resorts, they put their management in place and there only concern is a healthy balance. While it seems like Siargao is on it’s way to another polluted paradise, it possesses something which the other tourist attractions did not have at the peak of their development. A growing community of residents and business owners and concerned visitors who work together to protect the island. Siargao is in it’s early stage of development but even at this early stage there is awareness of this issue because there are other tourist sites around Philipines where they woke up at it is too late. If things are done consistently with everyone on board there is the possibility maybe, that Siargao can be truly sort of a green island as an example for everyone. The locals are selling their lands because they don’t have money and once they don’t have food on the table they sell their lands. That’s what’s been happening for years. If people get jobs and work in Siargao and are persuaded not to sell their lands and look for jobs and eventually build resorts themselves on their lands. A prime example is The Kermil Resort on Siargao who was one of the first surfers started of with just a home on his land and then build two cottages and eventually ended up becoming the Kermil Resort one of the best on the island. 2018 has continued a rapid influx of tourists in Siargao, straining the island’s ability to absorb the impact in terms of trash. The local government has announced plans to build a centralized solid waste management system and create a master plan to manage development. P.S Do your bit by visiting and advising others to take the garbage back home or use items which can be used again. If you’re into surfing or just chilling out, Cloud 9 Siargao is the place to be. Being one of the top Siargao tourist spots, it’s swamped with cool restaurants (vegan and non-vegan) and some unique local clothing brands. You’ll definitely be able to spend a day or two here. 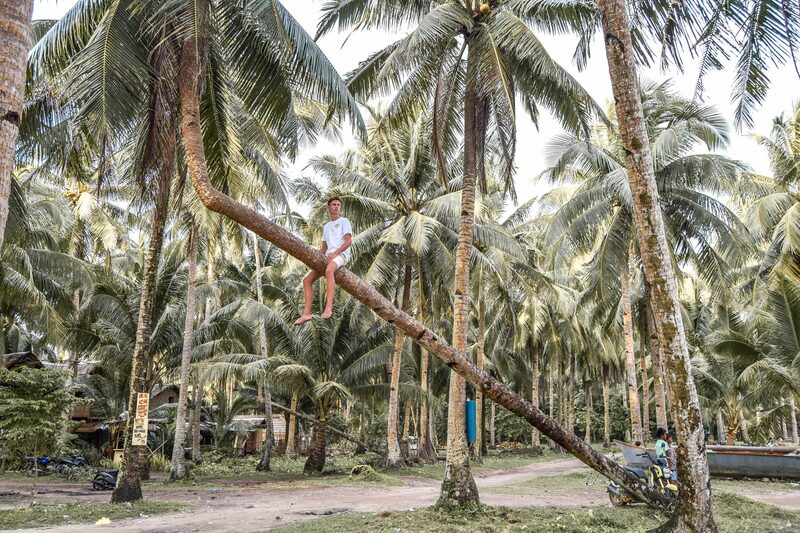 Things to do in Siargao – CLIMB PALM TREES! A famous insta-spot as well as one of the top things to do in Siargao, these luminous blue rock pools are an awesome choice to jump in. Check the tidal schedule and make sure you head at low tide (for us it was between 2.30-3.30pm) for some awesome backflip opportunities and crazy coloured water. Another massive photo opportunity is Sugba Lagoon and one of the Philippines major tourist attractions. You may have seen the photos of the random diving board into the ocean on fliers…well this is it! When you’re ticking off all the things to do in Siargao, this cannot be missed. Firstly don’t get ripped off by a tour company – they try to charge up to 3500 for a boat. You can head down to where the boats leave (opposite Curry Pot) and negotiate with the drivers, or book directly through Jing’s Place. It’s an all day thing and doesn’t include lunch, so grab something local to take with you and plenty of water! There is a small fee for two of the islands… Naked Island Siargao – free, Daku Island – 100 Pesos per boat and Guam Island 20 Pesos per person. It’s something they do to encourage the younger generation to look after their surf beach. It’s an amazing experience. Help clear the plastic and rubbish from the sand before heading out on the boards and surf! This is not usually a common recommendation of things to do in Siargao but if you are heading up North…make sure to head through the man made forest Siargao on the way back down. It really is beautiful. Ronaldo’s – For cheap local food this place can’t be beaten. Kermit Surf Resort – Possibly the most popular hang out on the island. It has everything from accomodation to a restaurant, surf shop, tours and even a little outdoor gym area. Aventino’s Pizza – At around 135 Pesos per pizza Aventino’s is both cheap and delicious. Siargao has a very local microclimate and does not have distinct rainy and dry seasons like much of the Philippines. Normally December, January and February have the heaviest rain. Things become drier in March, April and May, then in June and July the rains gain strength again. In August until October the rain showers are less. The best surf is from August until March, there is an annual surf competition in September that attracts competitors from around the globe.